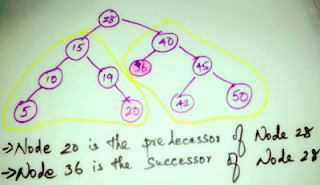 In a given Binary Search Tree need to find the predecessor and Successor of a given node. What is Predecessor and Successor ? then, node 20 will be the Predecessor and node 36 will be the Successor. Lets see simple example as how to find Inorder Predecessor and Successor for any given binary tree.